Bank Run In Southwestern Chinese City Could Signal "Impending Financial Crisis"
Ever since China's shadow banking sector peaked two years ago, one of Beijing's biggest financial and social stability concerns was of widespread, out-of-control bank runs which if left unchecked, could cripple China's massive, $35+ trillion financial sector, and which prompted the authorities to launch an aggressive deleveraging campaign targeting China's shadow banks. And while China has had its close encounters with the occasional bank jog, it always succeeded in intercepting them just in time, or threatening a crackdown if such "behavior" persisted; as a result financial stability was preserved. That may be about to change: in what the Epoch Times warns could be the "sign of an impending financial crisis", a small local bank in the southwestern Chinese city of Zigong just suffered a bank run. Shareholders of Bank of Zigong in Sichuan Province absconded with 40 billion yuan ($5.78 billion), through loans issued to shell companies that they had created, according to a Nov. 2 post in a Chinese social-media account, and a report by Da Zhong, a state-run news website. The loans were long overdue, resulting in huge losses for the bank. 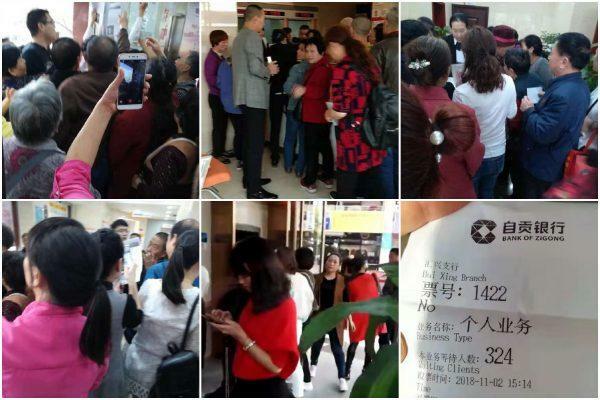 Even though the post was deleted within 20 minutes by internet censors, the news spread like wildfire and scores of bank customers rushed to dozens of bank branches in Zigong City to retrieve their deposits, while long lines of people could be seen from photos of the scene and uploaded by netizens. Shortly after, the Zigong City branch of the national bank regulator, China Banking Regulatory Commission, sent out an emergency notice seeking to calm customers. The notice indicated that the Bank of Zigong, which was founded in 2001 and has 32 branches in the city of 1.2 million people, is running normally and has sufficient cash flow for reserve funds. While the local police also announced the arrest of the person who spread the "online rumors", that didn’t stop customers from rushing to the bank. Though the rumors were unconfirmed, the resulting bank run by panicked customers could spell serious trouble. As more customers try to withdraw funds, Bank of Zigong may eventually default. That would have broader repercussions for the Chinese economy, as the Bank of Zigong exemplifies a common situation in many regions across China. Like many economic hubs in China, municipal authorities in Zigong have borrowed large sums from the Bank of Zigong to finance local infrastructure projects. The bank explicitly explains on its website that the institution supports initiatives by the city’s Communist Party committee and government authorities such as building projects, city redevelopment, state-owned enterprises reform, and more, according to the Epoch Times. Zigong City, as with many other municipal governments, has set up local investment firms as a popular option to borrow money. But that has led to enormous debt that governments couldn’t repay. The Chinese regime recently published rules that allow these investment firms to file for bankruptcy if they don’t have the funds to repay their debts—highlighting the severity of the situation. Economists - at least those outside of China - have warned that when the city investment firms go bankrupt, the domino effect on banks that loaned money to them, as well as the private individuals and companies that invested in them, would be detrimental. “When city investment firms have no way to repay their debts, the Bank of Zigong will be in a crisis,” said Zhao Pei, a current affairs commentator at NTD Television, part of the Epoch Media Group. More ominously, Twitter user Cao Ji, a former professor in Shanghai, who now does academic research in Taiwan said that "if there is a bank run at the Bank of Zigong, this means a financial crisis in China will begin from these local small banks." Meanwhile, there are also clues that what was said in the initial social-media post that sparked panic may be true. The post listed three companies as the bank’s majority shareholders: a real estate company; a conglomerate with portfolios in residential development, commercial real estate, and manufacturing equipment; and China Western Power, a firm that manufactures and distributes boilers. China Finance Information, a financial data portal, released a public announcement stating that after China Western Power invested in Bank of Zigong, it became the bank’s largest shareholder, with a 20% stake. However, according to an Oct. 8 report by the Changjiang Times newspaper, China Western Power is currently in financial distress, due to - what else - high levels of debt. As of the end of June, the company’s debt-to-asset ratio reached 77.52%, an increase of 10% from the end of 2015. The company also needs to repay 1.01 billion yuan (about $146 million) in loans by year’s end, and may be unable to meet its obligations. The company’s shares have continually fallen since May, and such financial straits would match the claims in the initial social-media post. There has been no additional information on whether the bank run involving the Bank of Zigong has been successfully halted, however as we noted just yesterday in "China's Middle Class Is Again Desperate To Move Its Money Out Of The Country", incidents such as this one demonstrate just how brittle China's banking system truly is, if the mere speculation of capital or liquidity insufficiency is able to prompt a vicious bank run. And while the large, state-owned banks are sufficiently capitalized, the risk is that either any of the remaining shadow banking institutions or small, undercapitalized regional banks are swept away before the government can respond, resulting in a mass financial crisis.